Red Knight was once part of a large crime syndicate and was one of the leaders (hence the codename). Though he was a very capable weaponsmaster, his skills have diminished due to age. Pushing at 60, he uses technology to ease the efforts of battle. 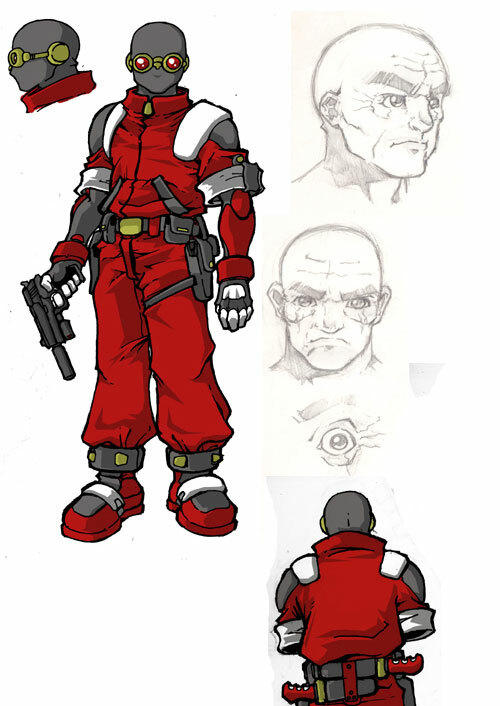 His suit is similar to kevlar and does not fair well to heavy artillery, his googles enhance his vision to 20/20 while his gloves use gravity motors to lighten the load of any weapon he is carrying (his normal strength isn't the same as it used to be). His main crutch are the boots he wears which he refers to as "moon boots". These boots use similar gravity motors but lighten his weight so he can move easily in the suit and is able to jump far and move fast. With his skilled use of the moon boots, he is able to scale walls at surprising speeds and for brief moments, stick to any surface. His armament varies but he sticks to conventional weaponry only since he is old-fashioned. He also attempts to avoid hand-to-hand combat unless necessary and for that, he utilises the long daggers fastened to the back of his waist. Though he has been out of the game for a while, he has come to Void City in order to prove he is still an efficient killer and hopefully gain his former position in the crime syndicate.